Check out what events NeighborWorks Waco has planned over the next year! Our Homebuyer Education is designed to educate and prepare the first-time homebuyer for homeownership. This class is taught by local industry professionals and focuses on each stage of the home- buying process. Homebuyer Education is offered free of charge, with breakfast and lunch provided. 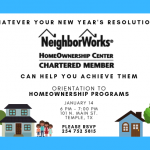 Let NeighborWorks Waco help you make your resolutions a reality! We have numerous programs that can make 2019 the year you become a Homeowner! Don’t let anything stand in the way of achieving your dreams!